Model Name: Cosmograph Daytona " Telephone Big Red"
Reference 6265 was introduced to the market in approximately 1969, and ceased production in the late 1980s. 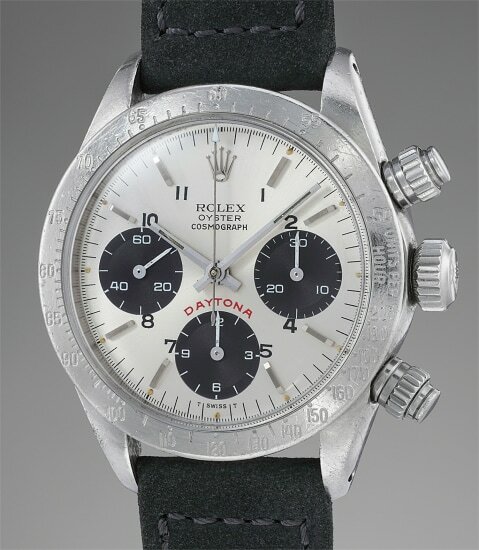 Compared to first generation examples of the Cosmograph Daytona, the model featured screw down pushers, and thus carried the 'Oyster' designation on the dial. The movement was also upgraded from a Valjoux 722 movement, to the more reliable Valjoux 727 movement. This extremely singular reference 6265 features a “Telephone” dial. In addition to having steel baton indexes and a “Big Red” designation, this watch also displays Arabic numerals printed directly onto the dial with black paint in the style of an old rotary telephone. It is our belief that for legibility purposes the owner of the watch had these numerals added at a later date giving the watch a rather unconventional yet interesting appearance. Having resided within the same family for many years, the reasons behind the creation of current dial can only be guessed.